Planning To Go RVing Full-Time? Are you just now entering the world of full-time travel or maybe dreaming of being a full-time nomad, so you can come and go as you please? Have you realized that setting down roots for the standard American dream (SAD) isn’t all that it’s made out to be? Are you looking for an escape of the norm for the possibility of many adventures in RV life? 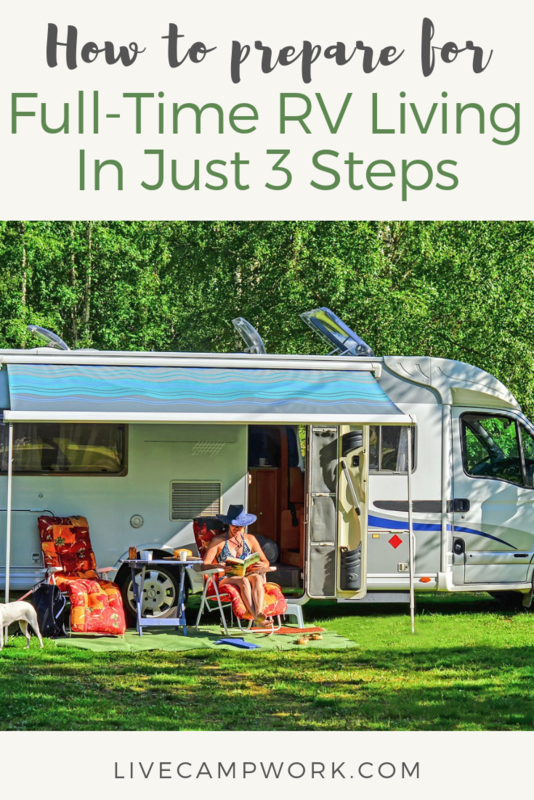 Well, wherever you are in your thought process, you’ve probably realized that there are several steps that must be completed prior to hopping in the RV and driving off in search of a life full of travel adventures from behind the wheel. Uprooting your life to cram yourself and what’s left of your worldly processions in to less than 400sq ft. will take some planning and prep before you’re comfortable enough to set out on that maiden voyage. I wish I could tell you preparing for RV life is easy and that anyone can make this dream come to fruition- but the reality is that RV life can be tough especially right there at the start when you’re trying to make sense of it all. It’s best to make sure you’ve done all the tasks necessary to make sure you have the smoothest transition and that you set yourself up for them most enjoyable experience you’ll have living on the road. People spend months and even years planning the exact day they will own their very own RV and travel full-time. Packing up and taking off. Cruising the highways and byways of the good ol’ U.S.A. and seeing all that this country has to offer is something special to look forward to. I can’t stress this enough… It will take time and planning to find the best way to make sure you stay on track and keep tabs on all the many tasks you’ll need to complete to make this dream come true! You’ll probably need a timeline to keep you on track. Don’t waste any more time. Start planning for your new full-time RV travel life right now with the following steps to help prepare. When you first get the idea to travel full-time you probably have the urge to read every RV travel blog you can find… GO FOR IT! Read all the RV travel blogs you find, then listen to all the podcasts and watch all the YouTube videos you can handle. Once you have your initial zombie search of all the greatest content from RV lifestyle bloggers- you can officially set a date that will be the start of your new adventure. It’s time to set your departure date and make your dream of RV travel into a plan to reach a goal. 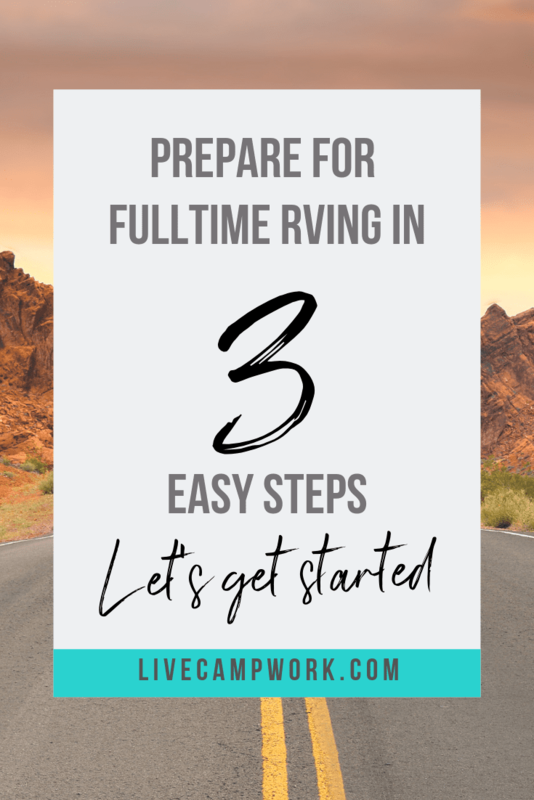 Create a sense of urgency and give yourself a realistic timeline to start putting the pieces together to start RVing full-time, by circling a date on your calendar, plugging in the date on your google calendar or adding a Facebook. Even if you aren’t sure of the final departure date, which many of us aren’t, you can still set the preliminary date and adjust it as needed once you have your task list worked out. Have an awesome, nearly brilliant, idea to go full-time. Google the idea and look at blogs of people who are doing it right now! Make the decision to do it and mean it. Tell your immediate family… and be prepared for their comments. Think about the logistics. How can you make this work? Set a start date! Circle it on the calendar. Start a countdown. And get pumped about hitting the road. Start a travel savings account! Start downsizing. Get rid of the stuff you really don’t need. Research types of RV and decide which layouts might work for you. Go to your local RV dealership or RV show and look around. Try to take your current job remote! Figure out how you will earn income. Research health insurance options. Look into RVHealth! Research camping memberships like Thousand Trails, Passport America & Harvest Hosts to save cash! List Your house on Airbnb or sell it. Tell your friends & Confirm your not Crazy!!!! Create a monthly travel budget. Decide on your RV & buy it! Keep downsizing! You can do it!!!! Have a Garage sale and get some travel cash! Think of small business ideas you can do from the road. Decide on which memberships you’ll need and buy them. Start planning the route! Where will you go? Choose and establish your domicile. Pick a mail forwarding service. Get a new license. Make sure the photo is great! Register to vote. Absentee is better than not at all! Start packing your RV… little by little! Get new vehicle tags.. Make it official! Research Workamping! Line up a few jobs! Make your first reservations for the first few months. Find ways to create space with organization in your RV! Finish packing your RV. You’re ready! Stop downsizing… Donate the rest! At some point in your planning, you’ll need to start thinking about what you’ll be keeping and bringing with you in the RV. Sure, you’re downsizing and donating and probably selling some stuff and throwing others away… But the limited items you choose to take with you are really what’s important! You need things that are useful and practical. What you’ll end up needing inside your RV to feel comfortable on the road, will obviously depend on your personal lifestyle, but in general, there are some items that just about everyone will find useful! Check out this RV Packing list to help you get started and decide what to bring along for the ride!